This is a guest post by Emily Baughman. If you want to guest post on Go Backpacking, please read more here. 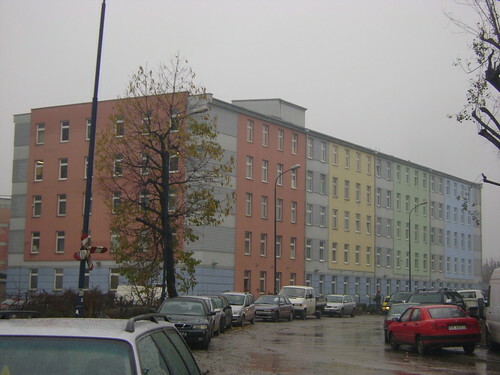 Cheery pastels only mask a former, dreary Communist block. In Lublin, I take bus #156 four kilometers out of the city center to visit the Majdanek Muzeum. Concentration Camp. Prison. Death Camp. Unlike Birkenau hidden in a rural field, or Aushwitz tucked behind a small town, the barbed wire of Majdanek runs along the main road. I can see small clusters of homes less than 100 meters from camp buildings. Not to mention a panoramic view of downtown Lublin. Majdanek was one of the largest prisons and is laid out in the eerie rows of rectangular wooden barracks. I start the tourist route entering the men's bathhouse. A building where men were both cleansed and exterminated. I read the sign in the first room and gasp at the grid of shower heads above me. I quickly move on to the next room before being trampled by the horde of naked emancipated men feeling the concave where their stomachs used to be. Knowing exactly how many spoonfuls of soup are necessary for survival. A peek into the next room isn't much better. Shelves of empty Zyklon B canisters. The poison of the masses. Saving the worst for last, is the room where people were locked and Zyklon B was dispensed. With an attached small closet with a square peephole to witness murder. “Sick…” I mutter aloud in disgust and rush to exit the building. After only these three rooms, I am unsure I want to visit the rest of the camp. I sigh, and realize that I must not to overtaken by ignorance. I walk along the stone road into the camp. I remember reading in a museum back in Krakow, that at some of the camps, the gravel paths were crushed tombstones uprooted from Jewish cemeteries. I pick up several of the stones at my feet. A couple could be fragments from the granite grave markers I have seen. Closing my eyes, I take a deep breath and move to the grass. One of the buildings has its door opened forebodingly. With hesitant steps, I peek inside. Shoes. Hundreds. Perhaps thousands of shoes. Tall metal crates with men's, women's, and children's footwear line the sides and run through the middle of the long building. I can't bring myself to enter this building; to get lost in the infinity of history's hostage remains. I finally made it to the back of the prison, to the crematorium. The name gives a more positive connotation that should be allotted to a structure not of death but of annihilation. It was with great trepidation that I finally entered the open doorway, braving my imagination of being trapped in a horrific nightmare. My shadow followed me through two empty rooms until reaching the back room. Unlike the other prison buildings I entered, only my lone footsteps echoed on the cement floor. I didn't hear despairing moans, cries of pain, or even soft sad sobbing. My own breathing seemed out of place in this black hole of existence. It wasn't the brick ovens that arrested my attention. Red brick with iron castings, resembling an old-fashioned country home furnace or an 19th century bakery. It was the metal stretchers sticking out of the openings. The same likeness of hospital stretchers used to carry ill human beings down a infirmary corridor. This is not a cozy cottage, a bakery, or a hospital. The intersection of images suddenly shocked. My whole body started quivering as I read the short signposting to my left. The heat from these ovens was used to heat the water used in the prison showers. The ashes were mixed in with the fertilizer that prisoners used during their forced farm labor. I glanced back at exhibit 1. This is not a replica or a reconstruction. These bricks smeared with the black smoke of singed human flesh. Next was the mausoleum. I walked up the steps, and peered under the large dome. I looked up and down the 5-meter tall pile of grey ash. There was another visitor to my right. Human ash. Our eyes met, and shared a brief, tight-lipped grimace. Any words would seem awkward or rude. The passing exchange was enough to communicate: This was real. This is real. On my way out of the camp, I looked over at the black crows like vultures encircling and swooping through the expanse of field. They must share my empty expired sensations. Suffocating in the crowd of ghosts among us. Photo courtesy of Emily Baughman.